"My two friends and I went to Salem, MA last year and had a ball. We went to a restaurant and had a 'pumpkintini'. Ever since, I've been experimenting with different ingredients and finally found a mixture that is OUT OF THIS WORLD! 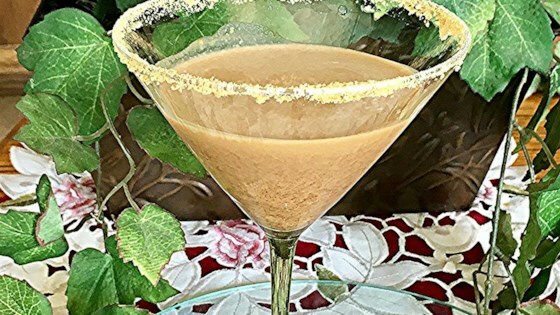 If you like pumpkin pie, you will LOVE this delicious beverage recipe." Pour the graham cracker onto a small, shallow plate. Moisten the rim of 1 chilled martini glass and dip the moistened glass into the graham cracker; set aside. Pour the pumpkin pie filling, rum, maple liqueur, and half and half into a cocktail shaker over ice. Cover, and shake until the outside of the shaker has frosted. Strain into the prepared glass, and garnish with whipped cream to serve. Great Pumpkin-tini. I used heavy whipping cream and maple extract because that's what I had. Other than that I followed the recipe. I like being able to drink my 'pumpkin pie'!